What a GREAT new set! Love the colors, the stamps and all the fun embellishments in this one!! I got mine in the mail last week!! I LOVE THIS KIT!!!! Loveeeee this month's kit!! YUMMY!!! I save greeting cards, magazines, old books, etc. and use them on card creations. I even have several old dictionaries as I love using the definitions on card creations! And old cookbook pages are a unique background for a baking layout creation! I have reorganized my scraps by cutting them into usable pieces and am happy with how much more I use them now. Anything not usable was recycled. These new products look amazing!!! I save my scraps. I need to work on my scrap organization though. I use the product packaging, and save scraps for cards! I have used product packaging, used things I would normally throw away to make storage containers, and use up my scraps. Loving the look of this kit! I save my scraps and they go to my daughters (there is a whole bin) for them to use in their projects. They especially love when I mess up stamped images! I'm very excited for the hop. I love to see all the goodness that the design team cooks up! I love the colors in this kit! I save all scraps, using even tiny slivers where I can. I also save packaging with interesting patterns and/or colors. If I'm hand delivering a card, I don't use an envelope, just let the card show on the top of the gift or just hand it over. They know you're giving a card, so it doesn't need to be a 'secret'. lol Every little bit of paper saved is important. I like to use product packaging because the patterns are usually pretty too. I like to use old music paper too. I have a paper recycle bin so all paper too small to keep goes in the bin to recycle. I save most scraps for se on later cards. I save used business envelopes for the inside designs. I like to save the clear acetate from stickers and use for stamping on and for other projects! I also put all scraps of paper and plastic in a baggie for recycling! I constantly keep things out of the trash to upcycle in my stamping space for gift giving! Love this month kit. I save all my scraps and try to use them asap. Thanks for the chance. I turn my scraps into cards and since my husband loves bottled beer I save all of the bottle caps to use in my projects. What a great kit. I save all my paper scraps, to make smaller projects. I tend to save containers that my supplies come in and reuse them to organize, too. Wow, loved all the DT projects using this awesome kit! Lots of fun fun goodies! As for re-using and recycling, I do it all the time. I save TP rolls for favor boxes and always reuse packaging!! I love seeing the different interpretations that the DT members come up with. I reduce, re-use and recycle many things in my craft space. One of my favorites is Toilet Paper cores. They make great mini books. I also like to use cereal boxes and pizza boxes provided they aren't gunked up. But I use scraps of fabric, yarns, ribbons, and just about anything around the kitchen from bottle tops to empty jars. I try to reuse mailers that are made from cardstock and have a blank side. I stamp on it, cut out the images and mount on my cards! I also re-use ribbon, gift packaging and even cute food packages! Such a cute kit. I love to reuse containers to make gift holders and I save ribbon from packages to reuse in crafting. I recycled all my unwanted papers to my friends, children and my church. I know these would be better used. I save scraps for cards . This looks amazing . Thanks for a chance to win. I save leftover card stocks even from my die-cutting and use those tiny spaces to stamp images. Some of the ribbons from wrapping, I save up for later use. i keep all my scrap paper in a file folder according to colour and I save the negative dies for either using on a card or using for sponging a mat. 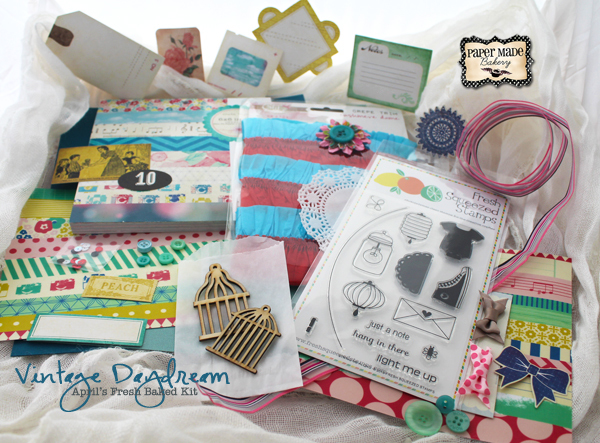 Fabulous looking kit.... so many great elements for loads of creative fun! I save all my scraps, even fairly small ones. I can always use them with punches or smaller dies!